This model 910 is specially designed to provide all of the features required to obtain outstanding results using the EMS Polisher. The Polisher is designed for SEM cross sectioning and also for TEM wedge polishing preparation. For instance, TEM wedge polishing requires that the polishing wheel rotates at a constant speed with high torque at a very low rpm. This combination of features is not found in standard grinders. Our model 910 provides all of the requirements that a Tripod Polisher needs. This includes the use of diamond lapping films and either colloidal silica or colloidal alumina suspensions. Plain backed diamond lapping film adhered to a glass plate by surface tension, and is easily removed for storage and re-use. Model 910 is also designed for ease of cleaning and disposal of abrasive debris. Dimensions: 21" x 13" x 11"
Water and slurry delivery system, Aluminum lapping plate (includes O-ring #50122-30 for metal holding band), Metal holding band (for holding abrasive papers and polishing cloth, #50122-31), Glass plate, Dust cover, Hex wrench set. Please see its replacement below, the ULTRAPOL Advance Lapping & Polishing Machine. Fast & repeatable alignment – precise 2-circle tilt-adjust, coupled with high quality linear bearings in the Z-axis provide for optical alignment that does not wander. Slurry polishing – A recirculating pump may be added, in addition to the standard coolant system. 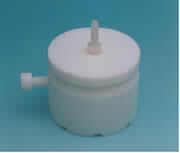 Slurries are held within a drip tray for easy disposal, or re-use. ULTRAPOL Advance has been designed to be an all-in-one lapping & polishing workstation for the production of flat surfaces. Advance's unbeatable combination of advanced control and process features allow for the accurate processing of modern generations of IC's. Topside electronic de-processing – enabled by the advanced angular control and optical enhancements such as ULTRACOLLIMATOR. Backside preparation of packages and wafers, particularly for flip-chips – and rapid global thinning of larger surfaces. Cross-sectioning of die and package-level devices. Along with its signature Quick Release interface and workholder technologies, ULTRAPOL Advance offers completely new designs for sample loading, oscillation and tilt alignment. 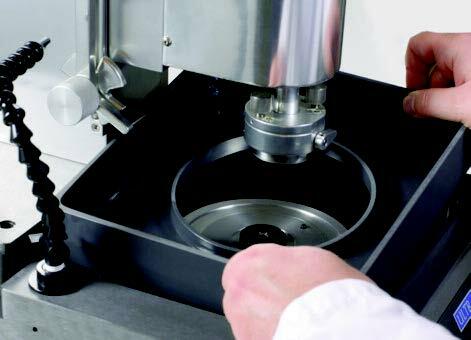 Fast and convenient sample movement between polisher & microscope, coupled with the option of the ULTRACOLLIMATOR optical alignment system, provides reference to the die -- a huge improvement over earlier generation polishers. The system allows recirculating slurry polishing (key for many delayering operations) as well as standard faucet coolant. 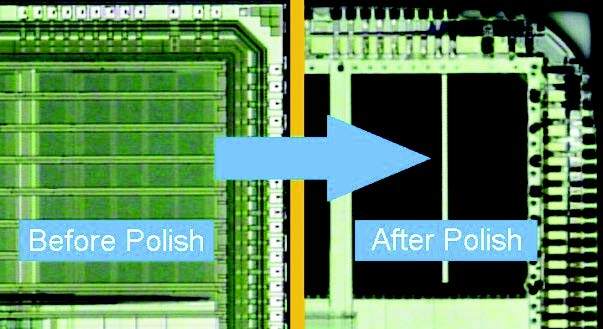 For aggressive material removal operations (such as the back-thinning of larger flip chips), a 'Power Polish' mode is incorporated that rotates the sample during processing. Our patented ULTRACOLLIMATOR technology allows for fast accurate and repeatable parallel alignment of surfaces to the polisher. Since the collimator beam optically aligns directly to the die, there is no guesswork or the need to use mechanical indicators. Alignment is constantly monitored during polishing. Transfer to-and-from the microscope is made fast and accurate. Any small realignments can be made quickly and accurately. ULTRACOLLIMATOR modules allow the user to produce the finest results of sample parallelism with both flat lapping and selected area preparation machines. The units produce a 'single box' solution, incorporating an lcd screen and all the controls required to align the sample. 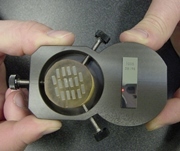 The use of optical alignment allows for simpler faster and significantly more accurate alignment to be achieved on a range of sample types and applications including: Crystal polishing, Double side wafer polishing, Topside de-processing of layers of metal circuitry for electronic failure analysis and competitive analyses, Backside polishing of packaged computer dice for 'through silicon' microscopy. ULTRAPOL Advance Polishing System includes: Base unit with timer, oscillator, speed control (50 to 400rpm), 8" (200mm) Polishing plate Sample Z-direction control with 1µm precision Mechanical alignment indicator 2 circle tilt control (+/- 2 degrees) Sample Rotation control Quick release interface mounting system 2 sample mounting plates and start-up accessory kit Sample Load Control - 0 to 3 kg (in 50 gram increments) Drip Tray / Slurry Containment Tray. 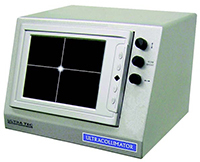 ULTRACOLLIMATOR includes: main unit, incorporating laser module, cross-hair generator, and 6.5 inch LCD monitor, with Video Out (NTSC). Includes optical flat and mounting bracket for ULTRAPOL advance. ULTRAPOL End & Edge Polisher has been designed to provide accurate lapping and polishing for most research and industrial applications. Key to the high quality performance of the unit is the calibration of the polishing base and the advanced angular control provided by the polishing head. Built-in features such as tachometer, process end-indicator, timer, and head oscillation provide assurance the finest surface production. Custom workholders can also be designed to your specific needs. ULTRAPOL End & Edge Polisher uses 8 inch diameter diamond lapping films which are easily changed for maximized output. Manual polishing tools remain important to the lab needing good delayering and/or crosssectioning results on a very tight budget. Our Disc Holding band works with ULTRAPOL 8" machines and many other 8" machines on the market. It holds down the lapping film or surface and can also stop splash. For quick, simple hand lapping applications, the manual lapping station has a smooth 8" glass surface to support precision lapping films. The fluid containment tray underneath the plate collects water run-off from the lapping surface for later disposal, keeping the polishing process area clean and contained. A Plexiglas lid protects the lapping surface when not in use and is an ideal, safe place to store lapping films flat. 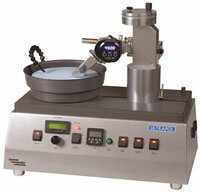 The manual station is ideal for short hand polishing processes and includes the glass plate and protective cover. 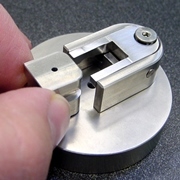 ULTRATOOL was designed for manual polishing of fibers, either supported (connectorized) or nonsupported (bare fibers), The tool uses various replaceable modules which are available for all types of connectors – if needed, custom modules can be designed and manufactured by Electron Microscopy Sciences. Key to ULTRATOOL's performance is a height adjust feature that is controlled by a fine pitch micrometer screw thread. 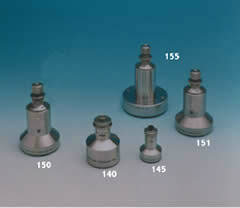 Flat, PC & APC polishes can be performed on all standard connector types. Another common use is bare-fiber polishing applications (flat and angled). ULTRATOOL is capable of holding bare fibers of the full size range and many other materials such as small wafer sections (for planar or edge polishes). Electron Microscopy Sciences is proud to introduce a new mass-production connector polisher. FIBERTEC can polish between 10 and 24 connectors at a time. The system's LCD screen makes process control and great connector polishing results easier than ever to achieve. Pressure and platen speed are controlled for ultimate consistency and performance. UT.MINIPOL.1 provides many of the features of larger polishing units in a small benchtop package – perfect for users with small production batches, or operating with a limited budget. All connector types may be prepared by the system, including SC, FC, ST, D4, SMA, bare fibers, PC, and Flat polishes are all accommodated by simple changes of the lap and/or the workholder. 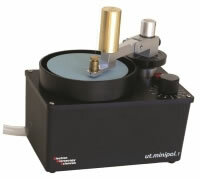 UT.MINIPOL.1 allows for use as a retropolishing machine or as a quick factory-use system whether used singly, or in tandem with other units. Electron Microscopy Sciences stocks a wide range of Polishing Films, Papers, Pads and accessories for all polishing applications. NANOpol offers the fiber optic communications industry the ability to produce accurate polished bevels on bare optical fibers. Angular control is achieved with the advanced positioning features of the integral micropositioned polishing head. Designed for the price-conscious university and research environments, NANOpol uses a 4 inch diameter polishing lap – a size specially chosen for improved flatness/run-out and low consumables costs. ULTRAPOL Sculpted end polisher offers the fiber optic communications industry the ability to produce accurate end profiles on bare optical fibers. Improved design of fiber holding, and all processing characteristics, provide concentricity of a couple of microns. This means that accurate bisecting of a singlemode (9 micron) fiber core can be achieved. Full angular control is achieved with the advanced positioning features of the integral micropositioned polishing head. This makes possible the production of the fiber lens shapes shown below. The system uses a 5 inch diameter polishing lap – a size specially chosen for improved flatness/run-out and lower consumables costs. 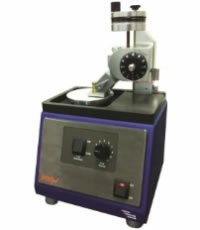 The Electron Microscopy Sciences Precision Lapping and Polishing Fixtures are designed to accurately produce polished parallel, tapered or critically oriented samples with minimal sub-surface damage. A series of specialized fixtures has been developed for lapping and polishing samples up to 6" in diameter, TEM samples and oriented crystals. In addition to size and shape, the fixtures differ in the type of thickness control techniques they employ. The Lapping and Polishing Fixtures are designed to be used either by hand or with a lapping machine (Model 920 above). Sample Mounting Fixtures are also designed to be used in conjunction with these fixtures to ensure that the sample is mounted parallel to the mounting block and that a thin, uniform layer of wax exists between the mounting block and the sample. 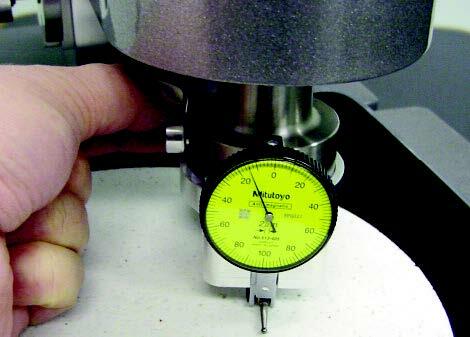 The micrometer method of thickness control employs a dial with 25 micron or finer graduations, that is adjusted relative to the outside support ring to set the amount of material to be removed. 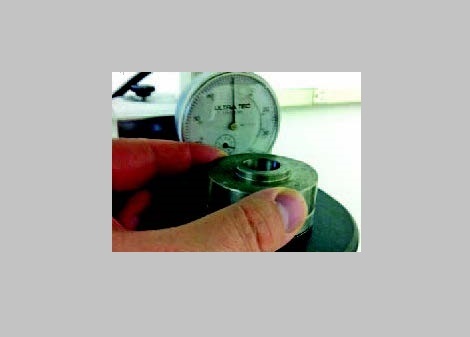 To set the dial, the sample is initially zeroed against the lapping plate and then the dial is adjusted to create a gap between the outside support ring and the center slide. This gap corresponds to the amount of material to be removed and gradually decreases, as the sample is lapped or polished, until the final thickness is reached. The load on the sample is varied by adding weights or finger pressure to the top of the fixture. 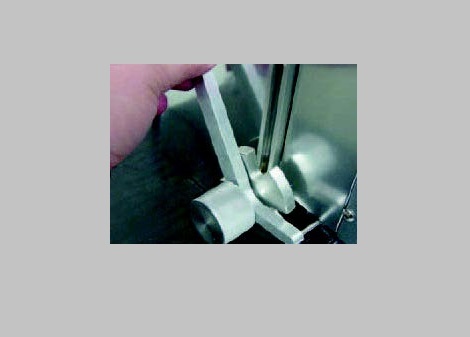 Due to the ease of adjustment, a micrometer controlled fixture is generally used when desired sample thickness will vary from sample to sample. 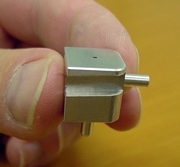 This model accommodates up to a½" sample mount, which is held in place using a threaded draw rod and locating pin. This small, lightweight fixture is ideal for hand lapping or polishing of samples less than ½" in diameter. The Model 147E is designed for edge polishing applications where rods, wafers, or fiber optic components are mounted vertically and polished edge on. 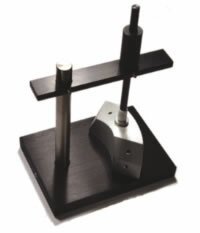 This model accommodates sample mounts up to 1" in diameter for both parallel and tapered samples. Angled blocks up to 45 degrees are available and are simply mounted in place of standard parallel mounts when tapered sections are desired. The mounting blocks from this fixture are directly transferable from any cutting saw. The Model 150 is for general-purpose fixture and is capable of lapping and polishing multiple small or large samples up to 1" in diameter. 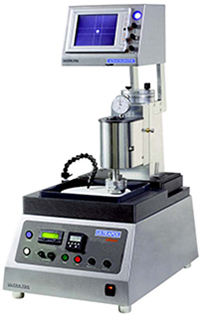 This model is identical to the model 150 except that the center slide is completely counter-balanced which enables the user to precisely vary the sample load. The model 151 is ideal when lapping or polishing very delicate materials, where only a minimal sample load can be tolerated. This model works the same as the Model 150, but accommodates sample mounts up to 2" in diameter. A streamlined design reduces the overall fixture weight, which makes it ideal for lapping either by hand or on a lapping machine. This model also has replaceable tungsten. 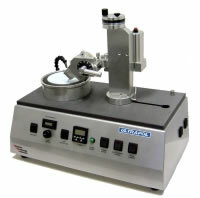 The Model 155V has the ability to mount specimen up to 2" diameter using vacuum. The Model 155D has a digital indicator allowing 1micron resolution during the lapping and polishing process. This model is identical to the Model 155 in all aspects, however, this model can be used to adapt an option of Vacuum (155V) or a Digital indicator (155D). 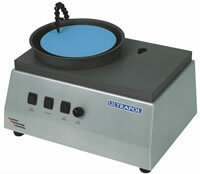 The Model 155V has the ability to mount specimen up to 2" diameter using vacuum. The Model 155D has a digital indicator allowing 1micron resolution during the lapping and polishing process. You can purchase this model with both options (Model 155DV). The Model 155L (Previously Model 154) is ideal when lapping or polishing very delicate materials, where only a minimal sample load can be tolerated. The 155L uses counter-balance springs to reduce specimen load. The fixture is capable of lapping and polishing multiple small samples or larger samples up to 2" in diameter. * 1 Vacuum Mounting Block (Series 50153) is required for #50150-00, and is not included. A custom pattern must be specified by the customer. All are 1" (25mm) Diameter Stainless Steel Mounting Blocks. The proper mounting of samples is a critical step in the lapping and polishing process. 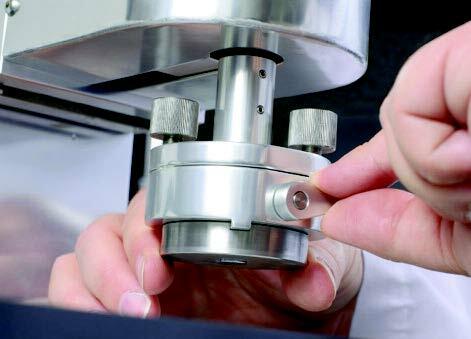 It is imperative that the sample is firmly mounted parallel to the sample mount surface the ensure accurate results. Typically, samples are mounted using a low melting point wax (such as EMS #50400-01). Sample Mounting Fixtures are designed to both monitor the temperature of the wax and to provide a uniform mounting pressure. When using low melting point wax, the mounting block is first heated on a hot plate then a thin layer of wax is melted evenly on it. The sample is placed on the mounting block, an appropriate size pressure plate is placed on the sample and they are placed together on the base of the mounting fixture. A Spring-loaded rod is then positioned in the center of an indent in the pressure plate while setting the pressure with the height adjustment of the arm. The whole assembly is then placed on a hot plate until the correct temperature is reached and maintained for a short while to ensure a uniform layer of wax cooling tray to facilitate the hardening of the wax. This model is designed to mount samples up to 2" in diameter and is supplied with 6 Pressure Plates ranging in size from½" to 2" diameter. The unit is also supplied with a set of tongs to lift the fixture when hot. 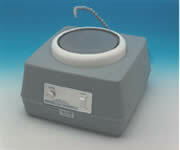 The model 110 is the most basic model and is ideal for routine sample mounting in laboratories. This model is intended to be used with a Hot Plate and is designed to handle a sample mount, which can slide directly from the hot plate onto the cooling tray platform without being lifted. The Cooling Tray consists of a large anodized aluminum plate with cooling fins that are designed to facilitate the rapid and uniform cooling of the Sample Mounting Fixture. This model consists of a replaceable 12" square glass lapping plate mounted into a cast aluminum tray. The tray is designed to serve as a secure surface for the glass plate while polishing with abrasive slurries, abrasive paper or abrasive films. The area under the glass plate acts as a reservoir to contain the used slurry or fluids. The Universal Sample Mounting Fixture is a versatile spring-loaded fixture for securing samples with pressure during mounting using adhesives, waxes, and epoxies. The fixture can be used at room temperature or on a hot plate for heat curable epoxies or faster drying of conductive paint. 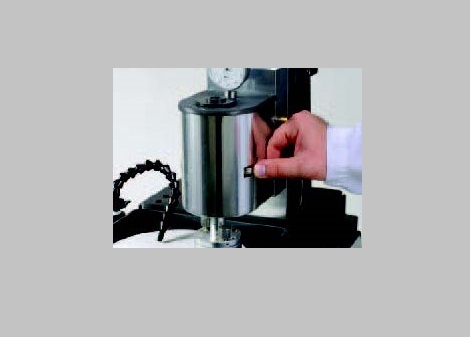 A scale on the pressure rod allows the user to apply reproducible pressure, from very light to heavy. Two interchangeable trays accommodate six different sized disk sample mounts (½", ¾", 1", 1¼", 1½", and 2" diameters) and five angled SEM pin stubs (0°, 45°, 52°, 70°, and 90°). The angled SEM pin stubs are held with screws on the angled surface so that the sample lies horizontally and the pressure applied vertically normal to the sample's surface. The 70° angle is useful for pretilted EBSD sample holders and the 52° angle is useful for FIB holders. The "PTFE" tip contacting the sample is compliant and easily cleaned if any adhesive inadvertently comes in contact with it. The fixture adapts to a large range in sample height. The polishing of semiconductor materials often requires the use of sharsh chemicals such as bromine or hydrofluoric acid solutions that would corrode the stainless steel from which most of the EMS fixtures are constructed. A special fixture for satisfying this requirement has been developed. The Model 160 is made of "PTFE" and is designed to hold crystal wafers up to 2⅛" diameter while they are being polished with very corrosive chemicals. The sample is held in place by vacuum and the sample is polished by rubbing the exposed sample against a suitable polishing cloth soaked with the chemical solution. 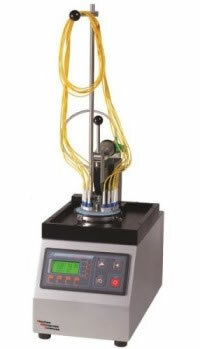 The Model 160 is ideal for damage free polishing of semiconductor materials with harsh chemicals and has been used extensively for polishing GaAs with bromine-methanol solutions.